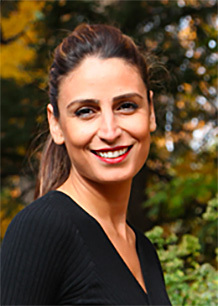 A licensed and practicing architect, Nazanin discovered yoga in 2005 when she came to Canada from her native Iran. A graduate of the Yogaspace Teacher Training Program, she began a personal spiritual journey when she discovered the inspiring teachings of yoga philosophy. She is passionate about weaving these profound yet simple teachings into her yoga classes. Nazanin believes that everything is about connections… the connection between the breath and the body, the connection we have to ourselves and the connections we create with others. As well as teaching at Yogaspace, Nazanin teaches private and group classes from her home in Thornhill.